This month marks the end of one era and the beginning of a new one at Phoenix Avenue, Wokingham. 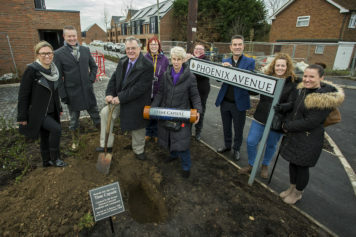 The formal burying of a time-capsule by former Eustace Crescent residents took place on a cold winter’s day, with a plaque commemorating the event and the plan for it to be dug up and opened in 50 years’ time in 2068! 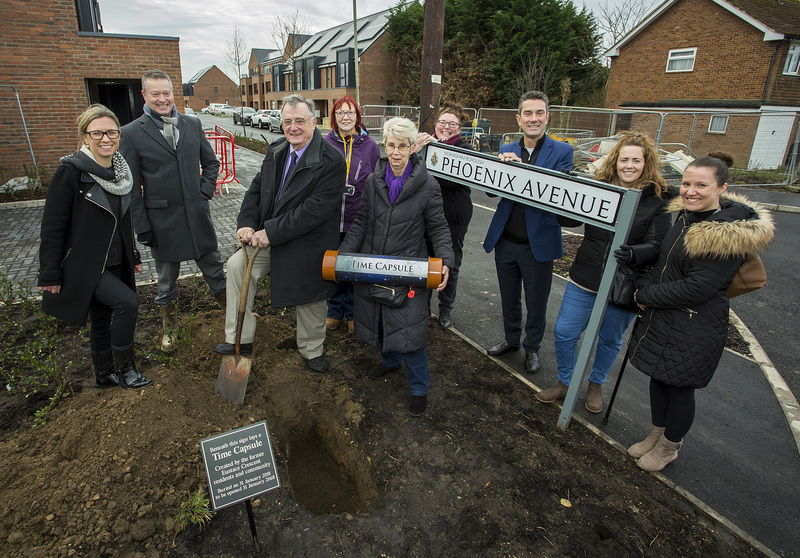 Former tenants, together with Council staff and representatives from Wokingham Housing (WHL) and Berry Brook Homes gathered to bury the time capsule. The original idea of burying the time capsule came from the Norrey’s Community Association. It was the perfect way to share memories of the Eustace Crescent estate as well as giving a glimpse of the strong community that surrounded it. Anna Holloway who was heavily involved in the community consultation for the regeneration of Phoenix Avenue; and is still an active member of the Norreys community, was given the honour of laying the time capsule that contained photographs, former residents’ written memories, newspaper clippings and a documented account of the Phoenix Avenue build. Anna said: “Eustace Crescent meant a lot to the local community and even after the regeneration has taken place it was important to us all to make sure that it is remembered”. David Chopping, Chairman of the Berry Brook Homes Board, who is the landlord for the new homes at Phoenix Avenue, spoke at the event and said: “When Eustace Crescent was first built, it was lauded as an innovative scheme, and developed a real community spirit; unfortunately though the flats did not stand the test of time. Through a lot of hard work and determination we got to here, the completion of Phoenix Avenue, but we are nothing without the past that came before us. To the generation of 2068 I hope that the contents of the time capsule relay the sense of pride and community spirit we all feel”.